In this high-tech world of ours, we all take a lot for granted with our electronic devices. Devices that we use regularly which provide us with valuable data via very complex systems. In fact we, with our smartphones and satellite TV systems are using so many "tools" in our day to day lives that we depend on. These technology-based systems and devices allow us to go through our days happily unaware of exactly how they are working for us. In the world of RV’s, one of the key technologies many of us have and use regularly is our satellite TV service. 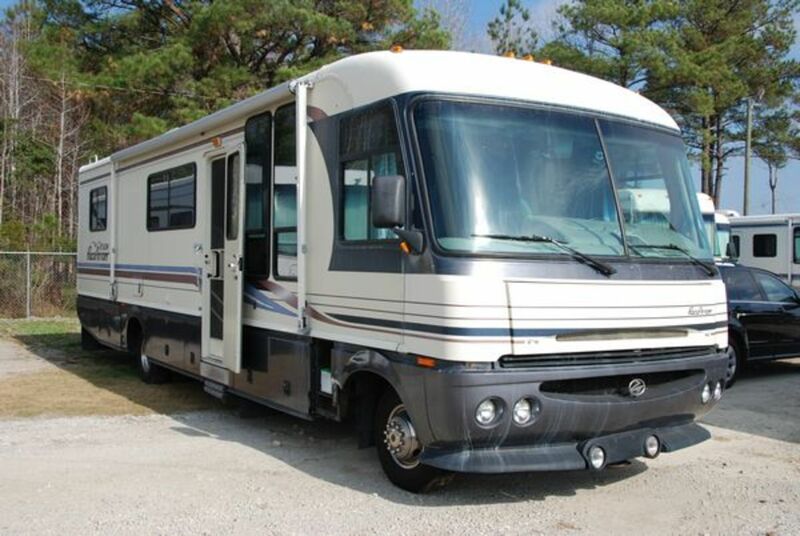 You see, living in the limited amount of floor space in a typical camper, for any extended period of time, can quickly become bothersome and even boring, even for those of us who are uncomfortable entertaining themselves. And satellite TV is possibly the most popular form of entertainment for evenings in an RV, or just when the weather is bad. Well, being an Engineer myself, I am familiar with how satellite TV works and I thought I could help my fellow campers understand how to set up and operate their satellite TV systems. This article will describe, in simple terms, some of this specialized entertainment technology for the reader and hopefully explain some tips on how to use it properly. My hope is that, when you are outside your RV, in an unfamiliar campground, and attempting to get your satellite TV to operate for you, you will have learned enough from this article that you can solve most of the typical problems you might run into. The Satellite in the sky, how does it do that? The actual existence of Satellites, hanging in in a fixed position in our skies, is a fantastic phenomenon that we all take for granted these days. Well, let me explain this thing called "geosynchronous orbit" as simply as I can. First of all, accept the fact that our planet is a spinning ball; a spinning ball that has gravity. This gravity thing, simply put, is a force that pulls things towards the center of all planets, including our Earth. At the same time, things such as; people, cars, rocks, everything that is loose, on the surface of Earth, would normally be tossed into space if it were not for this Gravitational force that pulls on everything. Powerful rockets are used to put; satellites, space ships, etc. into the sky until they are far enough away from this gravitational force and then place their payloads into their own orbit around the planet. You need to understand that the further one of these rockets gets from the surface of the earth, the weaker is the force of the gravitational pull on the rocket. Well, if you can imagine this, when an item is traveling away from the surface, at some distance which is determined by it’s size and speed, (usually tens of thousands of miles away from the surface), it reaches a point where, if it goes further, it will escape gravity and continue into space. And, of course, if it’s just a few feet short of this point, it will eventually, weigh too much and start to tumble back through the atmosphere and eventually crash onto the planet’s surface. The art of satellite technology is to get a satellite to this specific point, then stopping it and being able to keep it in this exact place, for a long time. A simple explanation of how this positioning is done is by a combination of; monitoring the exact position and speed of the satellite itself, usually from the ground, and then using small jets placed onto the body of the satellite which can “nudge” it back into it’s proper position. Receiving good satellite signal just requires 3 things; a LEVEL antenna, that is points in the right DIRECTION and points at the right ELEVATION. What the satellite TV people can then do with this permanently placed satellite is is use it to sent=d signals to a very large section of the earth's surface. The people on the ground transmit a dense stream of data directly at the satellite. This data includes not only TV network data, but codes to authorize your Receiver for reception, and much, much more. The electronics of the satellite itself decodes this data, reformats it and then retransmits it back to the planet in the form of specially encoded TV channels that your Receiver is designed to receive. So, here we are, people all over the US (and world) sitting in our homes, or in my case in my motorhome, and we want to have TV for our evenings entertainment. Well, the problem for may RV owners who travel around the USA is that there is no conventional TV signal available to many people in a many campgrounds; which is where I happen to be, so what do I do? Of course, the satellite TV companies have designed a way for us to pick up hundreds of TV network channels simply by providing us with a small receiver box for use with their system. This receiver box can decode the specific signals from the company’s satellite and provide an HDMI connection to a standard TV for everyone’s entertainment, at home, or again, like me, wherever I happen go park my motorhome. I keep several of these in my RV and use then for leveling my RV, but most importantly for making sure my Satellite antenna is positioned perfectly level. Otherwise all of your other adjustments will be off. Now, one more thing needs to be explained; the receiver box needs to be connected to a special outdoor antenna that collects the satellite signal and provides it for the the receiver box to use. These received signals, transmitted from the satellite are at very low power levels, so what is received needs to be amplified and cleaned up in some way. This is done with several things. First of all, the antennas are curved, dish-shaped, reflectors which have a strange looking thing called an LNB (Low Noise Buffer Amplifier) hanging on an arm pointed at the center of the curved antenna surface. Simply said, the signal that hits the curved surface of the antenna is reflected at the LNB and is thus “concentrated" at this point, giving the signal the same effect as being amplified. The LNB itself, gets a DC voltage from the receiver, via the connected coaxial cable, which powers it up so that it can do two things; amplify the desired signal and at the same time, reject any unwanted signals, or noise, fro going to the receiver box. This received and amplified signal is sent to the Receiver box via the same coaxial cable that provides the DC voltage for the LNB. There are all kinds of antennas available for use with satellite receiver systems; from your simple fixed reflector designs with a single LNB to more complicated models with multiple LNB’s and even motorized scanning antennas in self-contained domes, all of which are controlled by the receiver box software. I use one of these whenever my Rv site has obstructions around. It gives immediate feedback when I do get my satellite antenna in the right position. So, you can now see that the first thing needing to be done for good signal reception from the satellite is to point the antenna as directly as possible at that place in the sky were the satellite is seemingly, just hanging. Try to picture the size of the whole United States and you can quickly understand that a person on the West Coast has to point his or her antenna in an entirely different direction than someone on the East Coast, or someone in Texas, or New York, etc. One way to determine where to roughly point an antenna is to use a fixed location that is always the same. In the USA. we have such a thing and it’s called our Zip Codes. Each Zip code is for a specific area of land in the US, and it never changes. So, using these zip codes, and the fixed location of the satellite, some engineers have come up with a data table that provides two unique numbers for anyone that gives the person on the ground a way to exactly align their antenna for signal reception, wherever they may be. Azimuth is the first number needed. It’s really relatively simple mathematics, using triangulation, to set your antenna to the right elevation, or azimuth. Using your Zip Code, you can look up the appropriate elevation to set your antenna to for proper alignment. 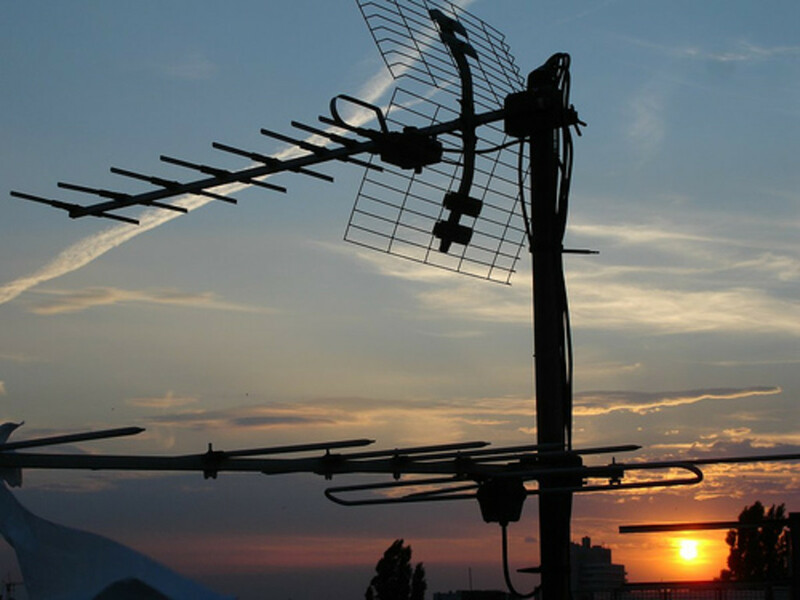 On all of the manual antennas, you just place it in a level position and adjust it’s manual elevation to the number provided by the satellite service company. The next thing you need to do is to determine the exact direction where the satellite is, in your sky. This number is also provided to you by the satellite service company and is given as the actual compass point you need to use to align your antenna. This number is in degrees and is easy to determine using a simple magnetic compass. Once you “point” your antenna to the proper elevation and then to the right compass direction you are ready to check if your receiver has signal. But, what do you do if you have no signal at all. You can possibly have nothing, no signal at all. This is the point where you have to deal with the reality of living on a planet full of hills, trees, tall buildings, and even the occasional heavy storm overhead. Any of these things will quickly become a problem if they are positioned between your Antenna and the location of the satellite in the sky. Finally, here’s the rule for placing your external satellite antenna. When you align your antenna, there must be no obstructions; no trees, no building, no hills, nothing! You need to understand, that signal transmitted from the satellite is at a very low level and it’s a long distance away, often circling at a distance of over 20,000 miles away from the earth. So, even with your parabolic dish reflector helping concentrate the signal, the level can still be just too low for your receiver, even if you are only a few degrees out of alignment. If you have a simple parabolic dish-type antenna then you will often need to “fine tune” your antenna for an optimum signal level. First determine the direction and elevation you antenna should be pointed. 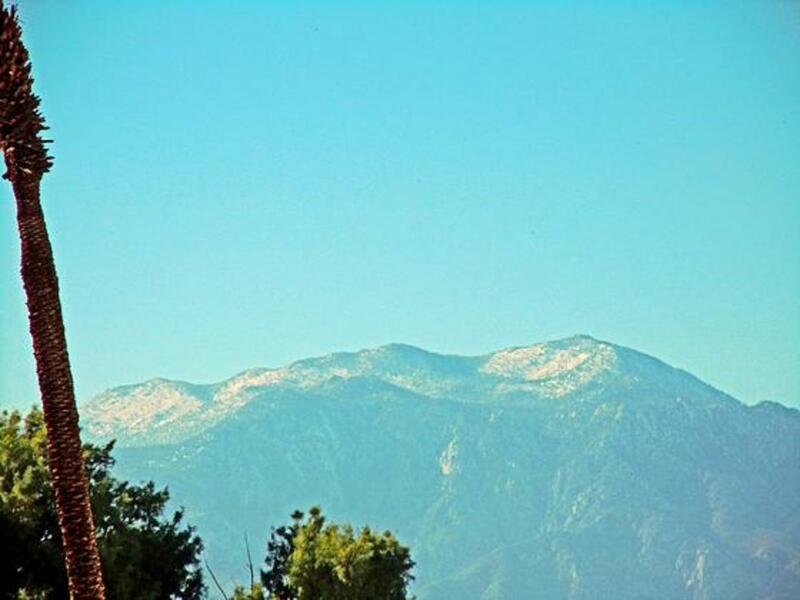 Check your campsite and pick a location for your antenna where there are no obstructions at that area of the sky. Set up and level your antenna, on a tripod or some steady surface. Then, set the physical antenna for the direction and elevation numbers you have already determined. Once the antenna is set up roughly, you should easily be within less than five degrees (left or right or up or down) of your potential peak signal level. As already mentioned, your antenna needs to be level and mounted on a firm base. If this is done, your rough alignment, just might be enough for a good signal, but, if not, you will be very close. So, the next step of “fine tuning” should be easy. There are several ways to get the optimal signal level for the location and here are a few tips to help. Purchase a simple, inline signal level meter. This meter, when placed in between the antenna and the receiver, will indicate when the received signal increases or decreases usually with a movement of the needle. If you have no such meter, then you can set up your satellite receiver to indicate the received signal level on your TV display. Move the antenna one or two degrees to the left and then check for an indication of signal on your Receiver/TV. If this doesn’t work move the antenna back to the center and then one or two degrees to the right and then recheck for an indication of signal. If there is still no signal then repeat the above steps but go four degrees, from center, this time. If there is still no signal after testing for six or more degrees, then you should reset the antenna to the center and try the same tests with the elevation (or azimuth). If, after all of this, you still have no signal then you either have an obstruction in your line of sight, or your cables to the receiver are not connected properly. For those of you who are lazy like myself, I recommend that you purchase one of the newer and very popular, automatically aligning, antennas available at most RV parts stores. These antennas work really well, from my experience, and they take all of that manual alignment confusion out of your setup, such as the; guess, move, check, then; guess, move, check, then; guess, move, check process that drives so many people crazy. Essentially, with these new Receiver/automatic antenna combinations, you are aligned by the system, or you have a specific kind of problem to consider. 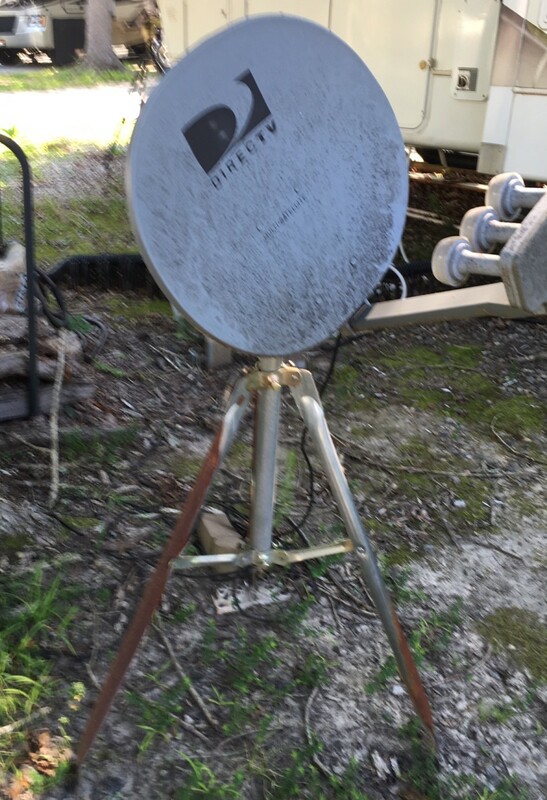 I, myself, use a DISH receiver in my motorhome and I have a dome-type automatic adjusting, antenna called a Tailgater which is popular with campers as well as people who, well, Tailgate. First you check for the direction of the satellite dome just as explained with the manual method. Then you set your Tailgater antenna dome on a level surface, and point the handle to the North. After connecting a cable between the antenna and the DISH Receiver, you go through a short startup procedure with the antenna and receiver connected via a coaxial cable and you connect the TV to the receiver. Once you have finished this, the receiver will detect the antenna and control it as it starts stepping the antenna, inside the dome, to the general direction needed. Then it will continually step through different alignments, vertical and horizontal, until an optimal signal is detected. At this point your TV will start receiving your favorite TV channels. If it tells you you have no signal, follow the instructions on the TV screen to get a resolution. The use of satellite TV in a campground environment can provide you with really some great entertainment when the weather is bad or just on a lazy evening inside your camper. The costs, over the past few years have dropped to where they are reasonable and even the cost from the service providers is relatively cheap. I will mention that at the moment, DISH has what I consider the best deal for the occasional camper. 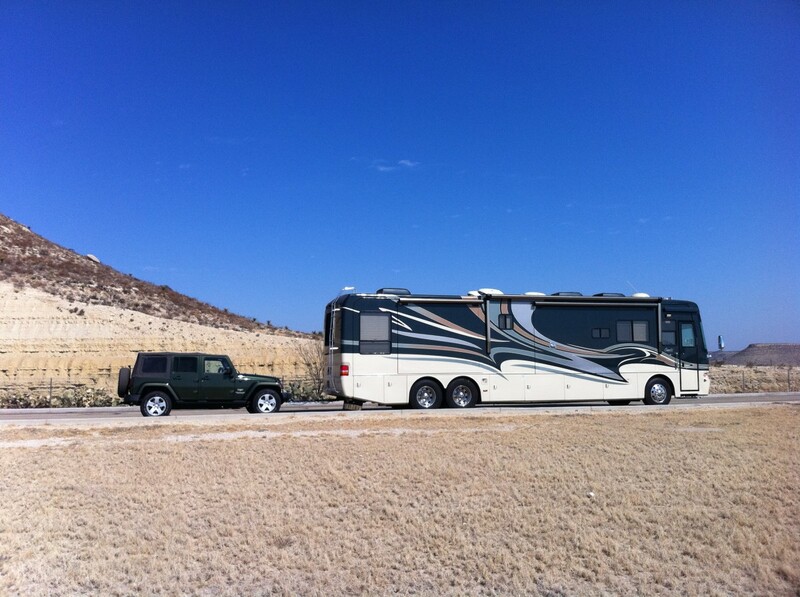 At the same time, DIRECTV has really good satellite service that works well for RV owners. 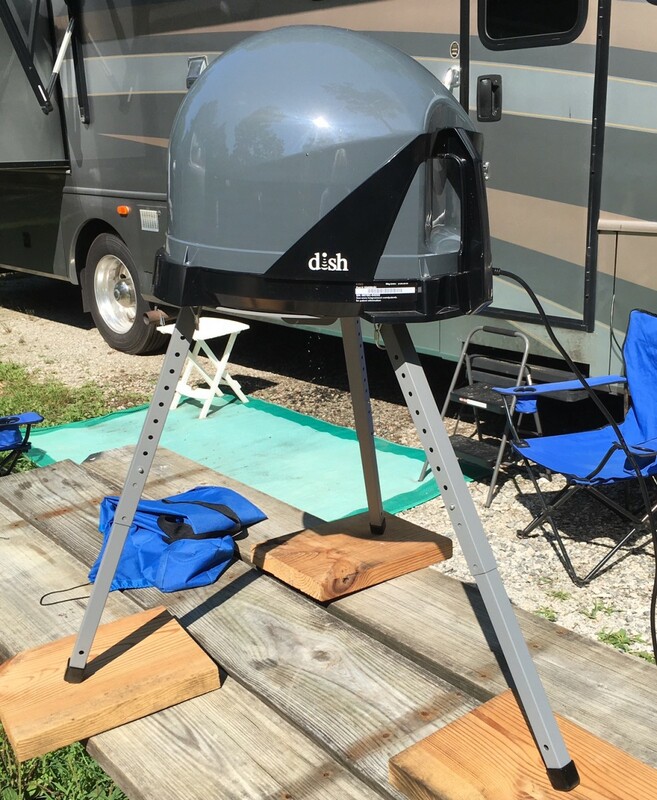 DISH has a package specifically for the occasional camper or the mobile camper. With this package, you pay for the months you need their service, and you aren’t held to any contract that makes you pay for those months you are not camping.